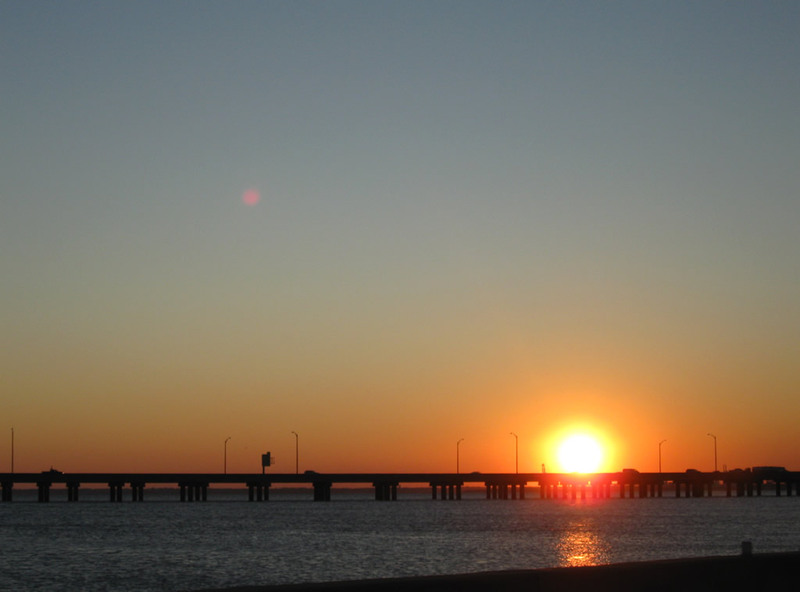 Sunset over the Mobile Bayway at Spanish Fort. 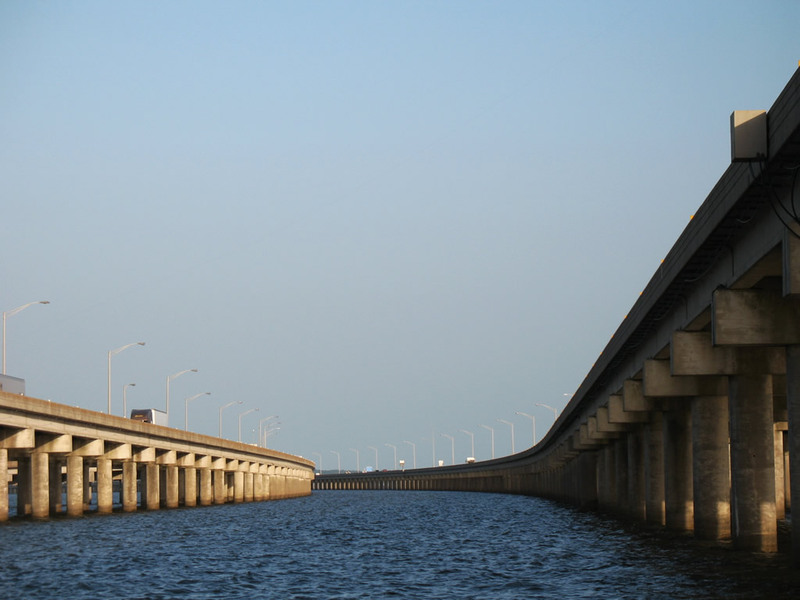 The Bayway is an eight mile viaduct crossing the Blakeley River, Tensaw River and northern reaches of Mobile Bay from Daphne and Spanish Fort west to the George Wallace Tunnel into Downtown Mobile. Photo taken August 29, 2008. 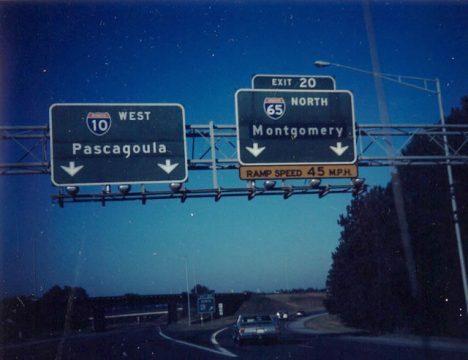 Interstate 10 traverses the southernmost portion of Alabama between Moss Point, Mississippi and Pensacola, Florida. The route aids in cross-country travel, commerce, and with hurricane evacuation. 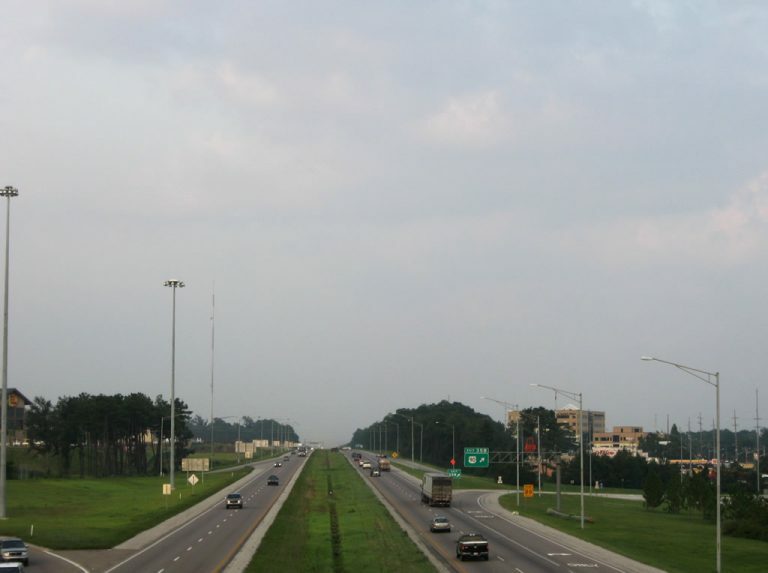 Serving the city of Mobile, I-10 also acts as the main commuter route to the growing Baldwin County suburbs along the Eastern Shore of Mobile Bay. ALDOT's long range plans outline expanding the entire 66-mile section of I-10 in the state to at least six overall lanes. 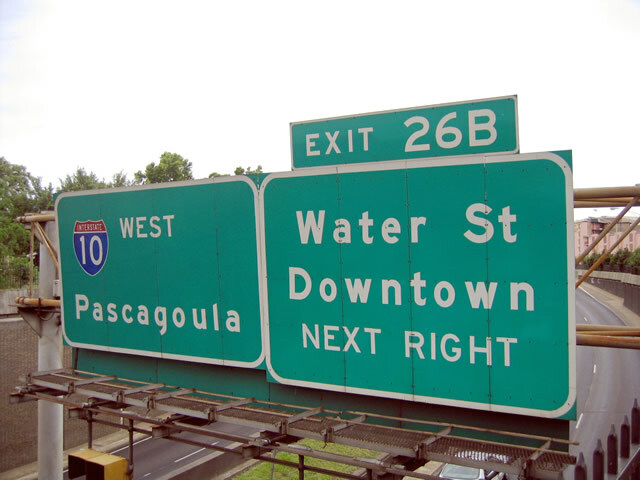 Presently the freeway expands to six or more lanes northeast from Exit 15 (U.S. 90) to the Water Street ramps (Exit 26B) at Downtown Mobile. Eastern view of I-10 from the U.S. 90 & 98 overpass in Spanish Fort. Rapid development along I-10 through Baldwin County added hotels, retail, apartments and medical complexes to Malbis. Photo taken August 29, 2008. 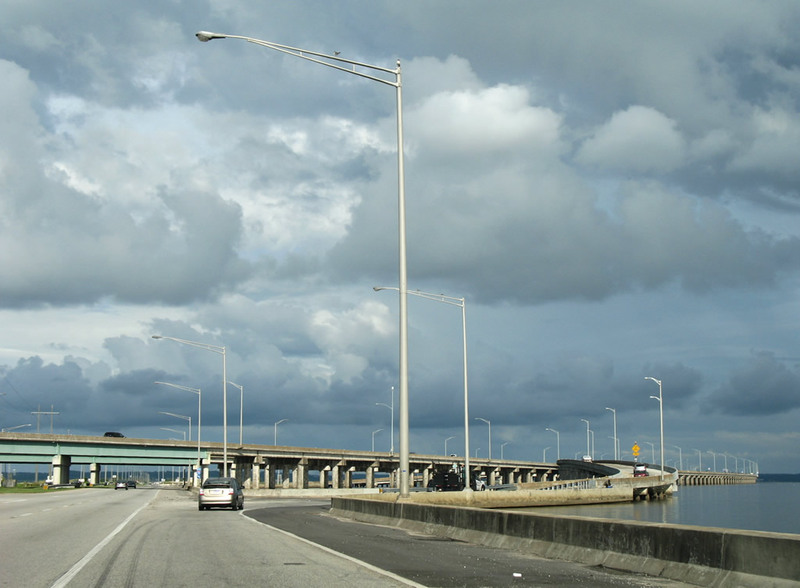 The Mobile Bayway opened to traffic in 1978. 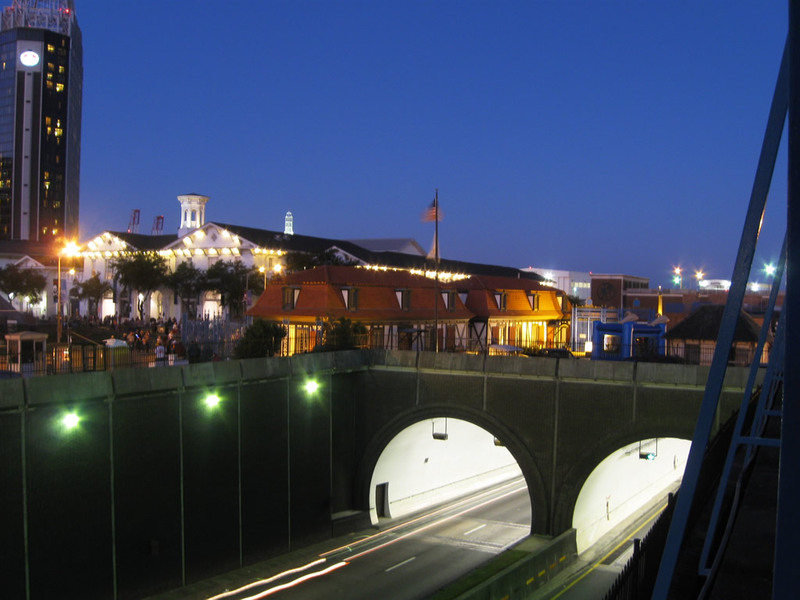 The twin spans are illuminated with overhead lighting. Dynamic message boards and variable speed limit signs are used throughout the eight-mile viaducts as well. These signs were installed after sea fog resulted in a catastrophic car pileup involving over 200 vehicles in 1995. During strong wind events, such as tropical storms and hurricanes, U.S. 90 & 98 along Battleship Parkway often closes due to tidal flooding. 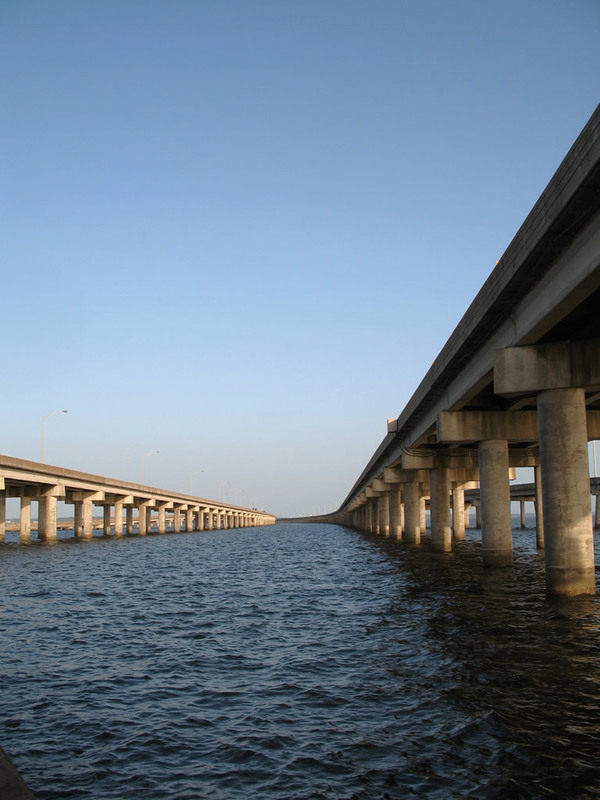 During these times, Interstate 10 provides the lone roadway between Mobile and the Eastern Shore in Baldwin County. 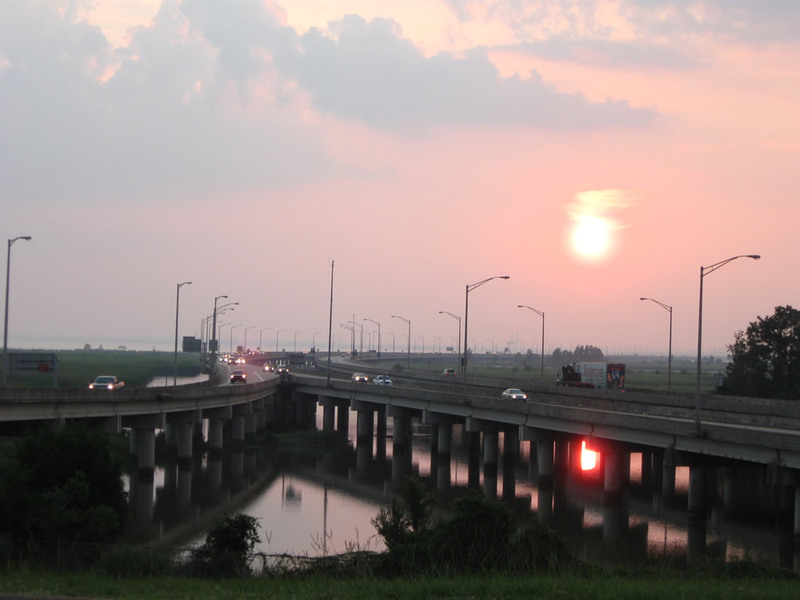 Storm surge from Hurricane Katrina in 2005 knocked out a portion of Mobile Bayway eastbound on-ramp from U.S. 90 & 98 (Battleship Parkway) at Exit 30. 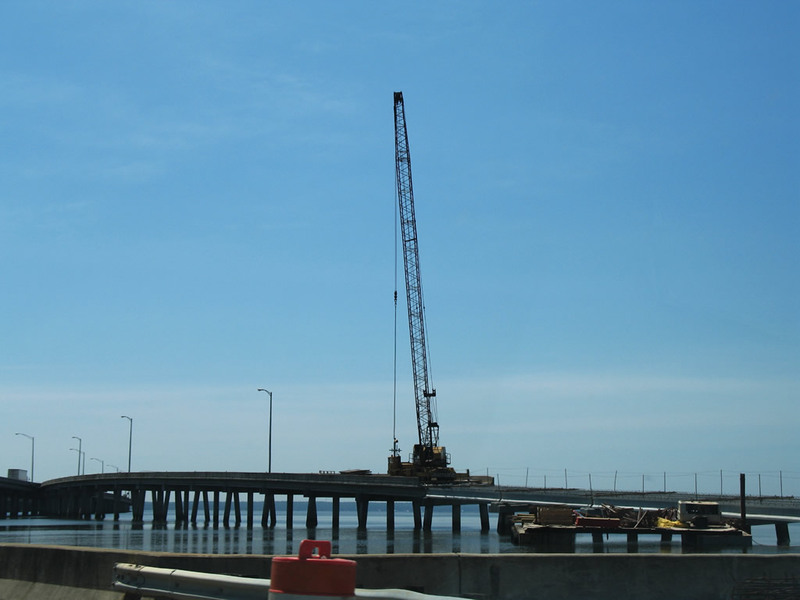 Construction in 2006 replaced the five concrete bridge spans that were destroyed. 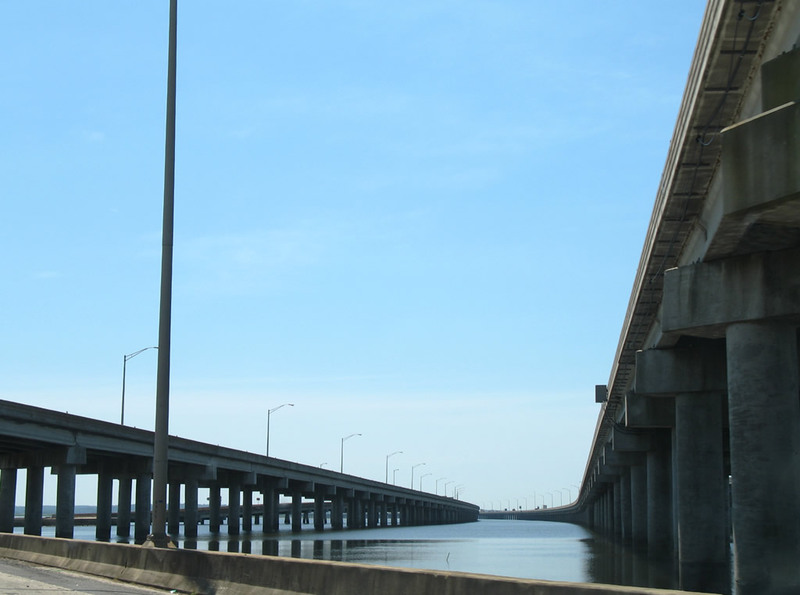 The bayway remains with just four lanes, but proposed construction of the new Mobile River Bridge for I-10 includes an expansion of the bridge system to eight overall lanes. 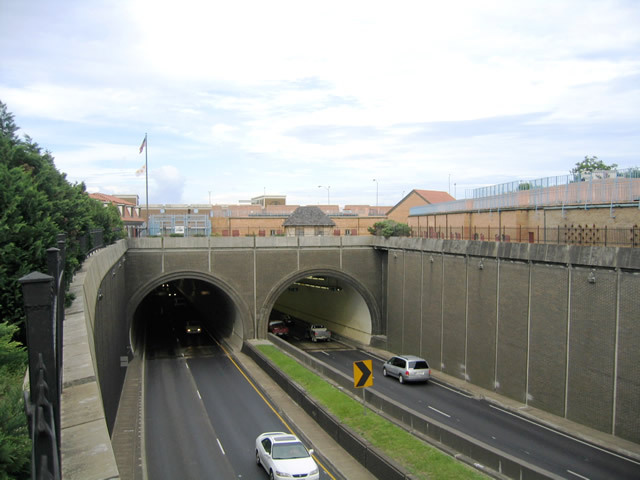 Interstate 10 through the George C. Wallace Tunnel opened to traffic across the Mobile River in 1972. 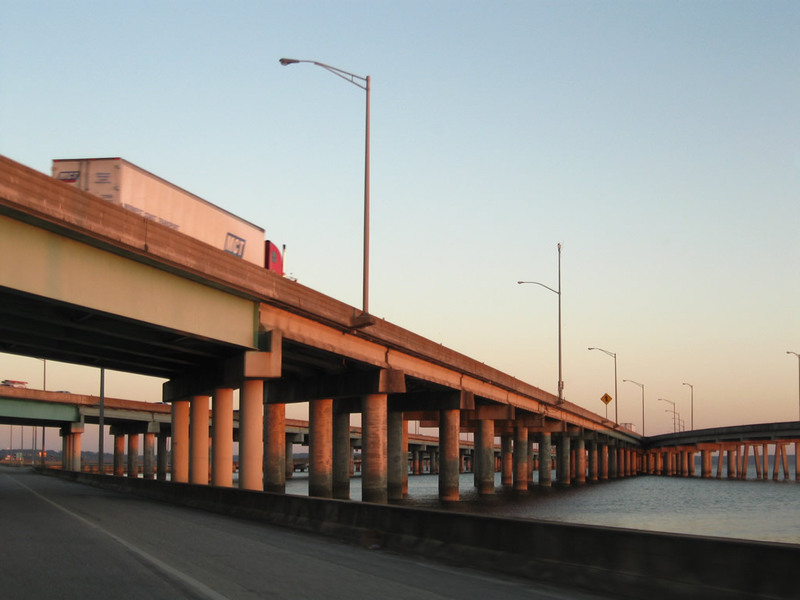 The proposed Mobile River Bridge for I-10 will bypass the four-lane tunnel. 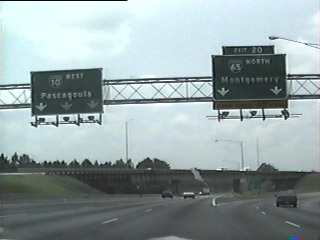 Interstate 10 west at I-65 in July 1989. 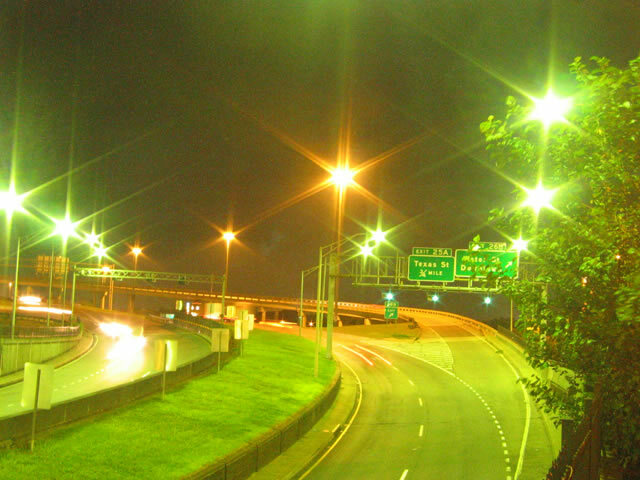 A greenout added Montgomery for Exit 20, reflecting the 1981 completion of the I-65 bridges over the Mobile River Delta. 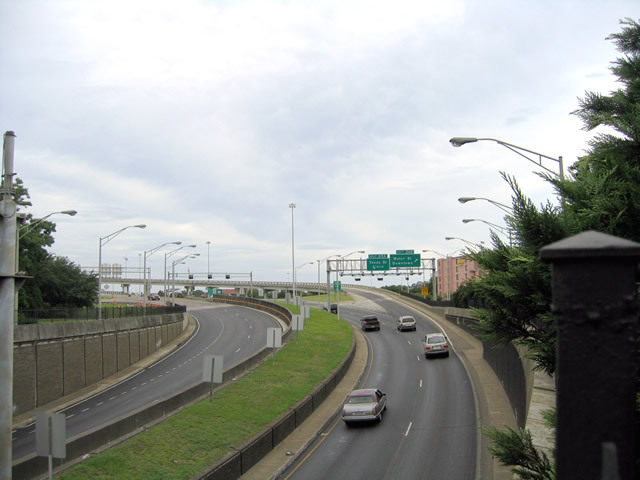 The initial section of I-65 built in 1960-63 was the Belt Line Highway between U.S. 90 (Government Boulevard) and U.S. 45 (St. Stephens Road). During this period, numerous trailblazers directed trucks carrying hazardous materials onto U.S. 31-43-45-90-98 in lieu of the Bankhead Tunnel. The U.S. 90 sign posted at the Exit 20 gore point was likely remnant from those early year trailblazers.2 Photo taken by Michael Summa. 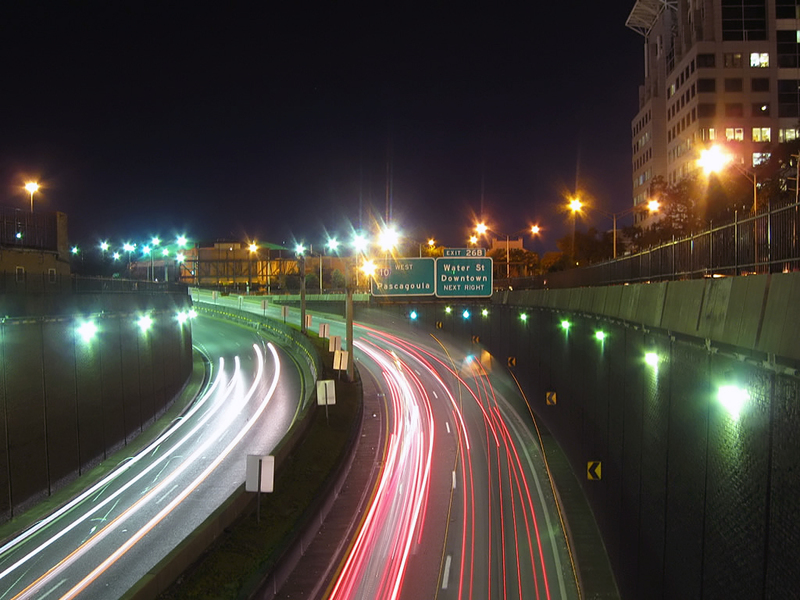 Interstate 10 west at Exit 20 was expanded to three lanes by 1993. 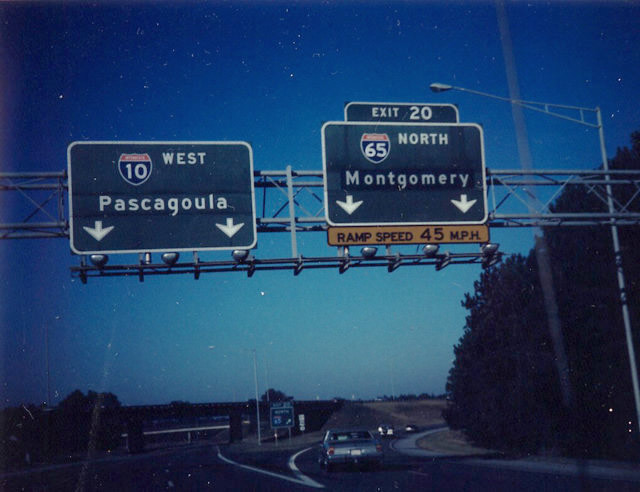 All Interstate 10 mainline button copy signage was replaced by 1996. Vidcap taken 07/23/93. A two lane frontage road connects Duval and Broad Streets as part of the split diamond interchange with I-10 in south Mobile. This scene looks east along the road as it departs Duval Street. Photo taken 05/25/12. The eastbound frontage road at Broad Street and on-ramp to Interstate 10. A CSX Railroad line spans Broad Street to the right. Photo taken 11/03/03. I-10 trailblazer posted along the westbound frontage road after Broad Street. Photo taken 11/05/03. The second of two turn-offs from the westbound frontage road connects with Nellie Street west to Kellogg Street. The frontage roads are otherwise access controlled. Photo taken 11/05/03. Interstate 10 trailblazer posted at the Alabama welcome center in eastern Baldwin County. Photo taken 03/18/12.